Our mailbox has never held such a fast food bonanza--just in time to tempt all the January dieters! My mailbox held the same stuff. 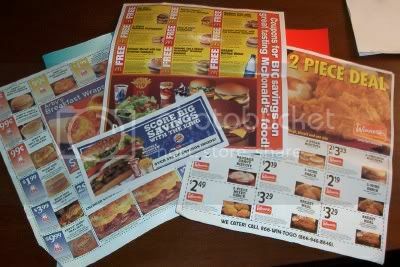 Why can't I get any coupons for someplace I'd actually like to eat? Well... I guess that'd be because those places don't offer coupons=) And by the wait there sometimes is to get seated, they never will. We seem to have very similar frugal tendencies! This reminds me of something I noticed in the Albertson's ad for last week-- they had a deep rebate for you if you purchased a combination of a certain number of Lean Cuisine entrees *and* a certain number of boxes of Keebler cookies. Not what I want in my house when I'm trying to eat light! I greatly enjoy your frugal posts! Thanks!